At the end of 2009, the news that legendary bassist/vocalist Aldo Tagliapietra – one of the most immediately recognizable voices of the original prog scene – had left Le Orme after over 40 years together caused widespread consternation among the fans of the iconic Italian band. The subsequent legal hassles related to the use of the band name added a sour note to the ending of such a long-standing, successful partnership. However, neither the remaining members of Le Orme nor Tagliapietra himself have let this unpleasant set of circumstances have a negative impact on their career. Le Orme’s 2011 album, La Via della Seta (recorded with former Metamorfosi vocalist Jimmy Spitaleri replacing Tagliapietra) got a very positive reception. On the other hand, Tagliapietra reactivated his collaboration with former Le Orme keyboardist Toni Pagliuca, as well as guitarist Tolo Marton (who appeared on Le Orme’s 1975 album Smogmagica), for a series of sold-out performances following their appearance at the first edition of the festival ProgExhibition in 2010, with violinist David Cross (of King Crimson fame) as a special guest. In May 2011 Tagliapietra released a double CD, Unplugged, featuring acoustic versions of Le Orme classics as well as his own compositions. Besides the above-mentioned activity, after his split from Le Orme Tagliapietra had been steadily working at his fifth solo album, eagerly awaited by his many fans. The album, titled Nella Pietra e Nel Vento, and released at the very beginning of 2012, is a summation of his artistic and personal experiences of the past few years, and marks a new stage in the artist’s career. It also sees his renewed collaboration with English artist Paul Whitehead, the author of legendary album covers such as Genesis’ Trespass, Nursery Cryme and Foxtrot and Van Der Graaf Generator’s H to He Who Am the Only One and Pawn Hearts (as well as Le Orme’s above-mentioned Smogmagica). Whitehead’s touch is immediately recognizable in the delicate pastel hues and peaceful, pastoral feel of the album cover, which is somewhat reminiscent of Italian Renaissance painting with its bold use of perspective. The painting’s title, The Stonecutter, is the English translation of Tagliapietra’s surname. A word of warning: those who are looking for Felona e Sorona # 2 need not apply, because – as even a cursory look at the track list will show – Nella Pietra e Nel Vento adopts a song-based, singer-songwriter style rather than a traditional progressive rock one. Those familiar with Le Orme’s early albums (especially Collage) will not fail to recognize the similarities between them and the elegant, exquisitely melodic compositions featured on Nella Pietra e Nel Vento. The prog imprint is present in the rich instrumentation, with the keyboards manned by Aligi Pasqualetto and Andrea De Nardi expertly weaving layers of lush melodies, supported by Manuel Smaniotto’s discreet drumming and Matteo Ballarin’s clear, flowing guitar work (De Nardi, Ballarin and Smaniotto are also members of The Former Life). All the songs on Nella Pietra e Nel Vento have a straightforward structure that privileges melody and accessibility over complexity. Though a couple of tracks border dangerously close to commercial melodic pop – with “Tra il Bene e il Male” (featuring original Le Orme bassist Claudio Galieti) being the main offender – the album leans towards a prog-tinged song form with occasional classical and folk influences that occasionally bring to mind the output of another outstanding Italian artist, Angelo Branduardi . The vocals (and thus the lyrics) occupy centre stage, which may not fly very well with those who are more inclined towards the instrumental showcases typical of conventional prog. Though those who are not familiar with Italian will inevitably miss out on the content, Tagliapietra’s deeply personal, positive lyrics feel like a breath of fresh air if compared to the current trend for doom and gloom. While his life-changing experience with Indian music and culture is often referenced in the songs, the influence of Eastern music is conspicuously absent from the album, which is instead permeated with the warmth and melodic flair of the Mediterranean. 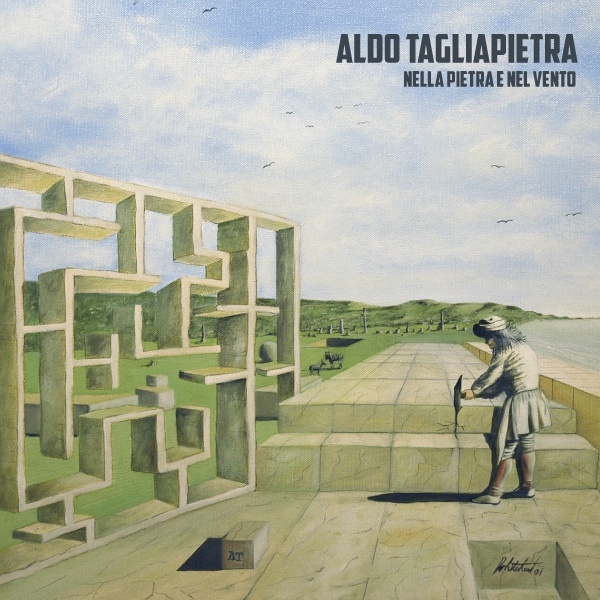 Clocking in at around 41 minutes, Nella Pietra e Nel Vento comprises 10 songs between 3 and 5 minutes long, in which the highly accomplished musical accompaniment provided by Tagliapietra himself and his young band act as a framework for the artist’s trademark vocals, slightly plaintive yet confident and expressive. While his voice may be an acquired taste for some, it is undeniable that, unlike what happened to many of his contemporaries, it has remained as strong as it was in the Seventies, and possibly grown even better with age. The title-track, introduced by the solemn note of a church organ, develops in a mid-paced, catchy tune that highlights Tagliapietra’s immaculate vocals and Aligi Pasqualetto’s rippling piano. Andrea De Nardi’s Hammond organ, discreetly yet unmistakably present to add fullness and a touch of spice to the sound, in contrast with the more lyrical voice of the piano, really comes into its own in the last two tracks – the upbeat, almost singalong “Dio Lo Sa”, whose folksy feel may recall PFM’s more light-hearted efforts, and closing track “Il Sutra del Cuore”, where the clear, chime-like tone of the guitar offset by the earthier rumble of the organ will not fail to evoke vintage Genesis. In contrast, “Sette Passi”, whose lyrics reference Buddha’s life story, is meditative and atmospheric, with mellotron providing a symphonic foil for Tagliapietra’s intense vocal performance. A classy, heartwarming album that, while not exactly prog, bears nonetheless the strong imprint of Tagliapietra’s long involvement with the genre, Nella Pietra e Nel Vento will appeal most to those who prize melody and singing rather than intricate instrumental flights. Lovers of Italian music are very likely to appreciate it, as are those who are seeking a respite from the many overambitious, convoluted productions of today. The positive attitude emanating from both the music and the lyrics is refreshing, as is the mix of child-like simplicity and wisdom that contrasts so strongly with the world-weariness (or even outright pessimism) of so much modern music. Nella Pietra e Nel Vento is clearly not for everyone, but still highly recommended to fans of the more melodic side of classic prog.